Where is Reunion Island? Do you know? 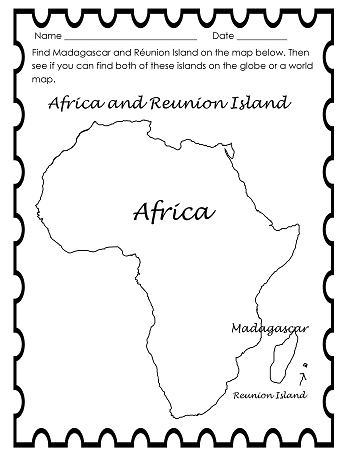 Many children can probably easily find Madagascar on a globe or world map. 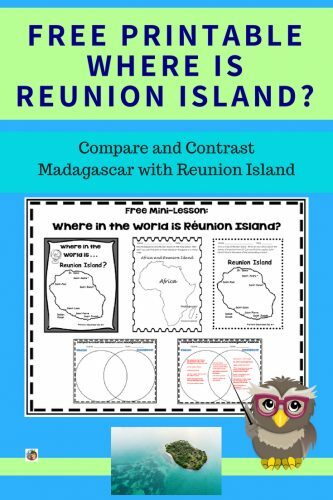 This mini-lesson will help extend their knowledge to another “nearby” island, Reunion Island, or La Réunion. With a fabulous landscape, volcanoes, adventure sports, and cultural activities, it is also very interesting. Many children will think they know all about Reunion Island — after all, it is near Africa, right? And they might have watched the movie Madagascar. The animals and wildlife on Madagascar are not necessarily on La Réunion! And La Réunion is a region of France, while Madagascar is not. Madagascar has more poverty than La Réunion. So it would be interesting for them to become aware that all islands near Africa are not the same. First, Where is La Réunion compared to the continent of Africa? It is that small dot near Madagascar. Would it, therefore, follow there isn’t much there? No, as tourism is a major business, and at the official tourism site there are 360 degree sea and sky views with breathtaking views. to prove it. I am only linking to this one page. So, here is my free printable. Classes may need a very short filler during the busy month of December or something for the fast finishers in class. This is just a mini-lesson and it is free. This map shows major cities on La Réunion. How did I learn about this island? Miss Owl’s mother is from that island, and also from France. Her family lived in both places. This image view “squishes” the page but it will look correct in the actual PDF. Madagascar has more wildlife and exclusive creatures. Reunion has more city areas, as well as their own astounding natural beauty. This is a great mini lesson, Carolyn and I’m sure it will be very useful. 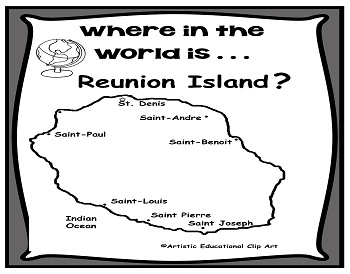 I just wanted to correct a few errors: on the map – it should be Saint Benoit (not Beloit) and just above it should be Sainte Suzanne or Saint André, I don’t know which it’s supposed to be. In the compare/contrast – Abolition of Slavery Day should be December 20th not 21st. In France (and Reunion) National Day is Bastille Day, they’re not separate, and it’s New Year’s Day not Eve that is a public holiday. Just for further information Tamil and Chinese New Years are celebrated in Reunion, but are not public holidays, and I wouldn’t really say that Reunion has “large areas which are poor for cultivation”. In Reunion if land isn’t cultivated it’s generally because it’s difficult to access due to the very mountainous terrain.